Antarctica (Section 16.3) is a continent in a hemisphere that is mostly water. The Arctic (Fig 1) is mostly ocean, surrounded by mostly land. Therefore the two polar areas are very different. Greenland is covered by an icecap up to 2,700 m thick. Its northern tip is less than 800 km from the North Pole. West of Greenland is the Canadian Arctic Archipelago (1, 3), extending from Resolution Island at 61� N to Ellesmere Island at 83� N, about 2,400 km away. It is almost entirely within the Arctic Circle (at 67� N). The Arctic Islands are numerous, the region is about two million km2, 65% of which is land. There are rugged mountains exceeding 2000 m towards Greenland, mainly Baffin Island, but the average elevation of the islands in the west is below 300 m. The vegetation in summer is tundra, wherever there is neither bare ground, snowfields or glaciers. There are a few other large islands in the eastern (Eurasian) hemisphere, in particular Svalbard and Novaya Zemlya. The RMS Titanic, a great ocean liner believed to be unsinkable, made its maiden voyage from England to New York in 1912. On 14 April, just before midnight, she collided at 22 knots with an iceberg estimated to be 70-150 m long and 20-40 m high above the water surface. The Titanic sank with the loss of 1513 lives in the icy waters. The collision happened at a latitude of merely 42� N. It is notable that huge icebergs last to such a low latitude (the same as that of Rome), after drifting from Baffin Bay within the Arctic Circle (Fig 2). Such drifts are relatively rare. It is estimated that of the 15,000 to 30,000 icebergs produced annually by the glaciers of Greenland only one percent (150 to 300) ever make it to the Atlantic Ocean. Icebergs of course extend much deeper in the water than they are high. The ratio of the submerged mass to the total mass equals the ratio of the density of ice to that of water, i.e. about 7/8. While almost all icebergs in the Southern Ocean are tabular (flat top), most are not in the Arctic, as in Fig 2. Most of the Arctic Ocean is over 1000 m deep and is continuously covered with ice whose thickness varies between 1-10 m. About one third of the Arctic Ocean is shallow, i.e. continental shelf. Over these shelf areas, ice is absent at least part of the year, but ice is found year-round over the deep ocean. Therefore the seasonal variation of the area of sea ice is smaller in the Arctic than around Antarctica. In the Arctic, the sea-ice area ranges between 9 and 12 x 106 km2 (as opposed to 4 and 19 x 106 km2 around Antarctica). As a comparison, the contiguous USA is about 9 x 106 km2 in size. Much of the Arctic seasonal variation in ice cover can be found in the Bering Sea (mainly adjacent to the continents, and south to the Aleutian Islands), and in the Sea of Okhotsk, as far south as 42�N, near Hokkaido, Japan. Yet even in winter the area between Norway and Svalbard is ice-free, notwithstanding its high latitude (about 77�N), on account of the Gulf Stream. There is some evidence that the Arctic sea-ice cover has decreased about 6% during the last two decades, and that the mean ice thickness has decreased as well. The sea-ice cover must have been thicker during the last Ice Age (esp. between 26 - 13 kaBP), because there is no sediment of atmospheric dirt of that age on the seabed (4). The amount of sea ice is rather sensitive to climate change: meltwater ponding, for instance, dramatically increases the albedo of sea ice, leading to enhanced ice melt. Unlike tropical oceans, which are temperature-stratified (i.e. there is a thermocline), the Arctic Ocean is salinity-stratified, although at high latitudes the ocean is much less stable. The temperature profile is nearly uniform at 0 to 1� C in the Arctic Ocean, but the salinity increases slightly with depth, especially at 10-100 m below the surface. The presence of this halocline is important in the formation of ice. Because of its salt, ocean water freezes only at -1.8�C. And salt water is most dense at its freezing point, unlike fresh water, which is most dense at 4�C. So if there were no halocline in the Arctic Ocean, the entire ocean column would have to cool to -1.8� C before its surface could freeze (Note 11.5). The Arctic Basin receives a large amount of fresh water from the large rivers on the surrounding continents (mainly the MacKenzie in Canada and the Ob, the Yenisey and the Lena in Siberia), and during the short summer these freshwater sources spread out over large areas. Because of its low salinity, this water remains close to surface and is first to freeze up in autumn. First year ice can be readily distinguished from older ice in that it is smoother and less thick. Even in winter there are usually long leads of open water, mainly downwind of continental areas. These leads, or polynias, are an important source of heat and moisture to the Arctic. Therefore even in winter stratus clouds are common. The Arctic Basin is virtually closed near Alaska, because the Bering Strait is narrow and shallow (~50m deep). There is some inflow of low-salinity water from the Bering Sea into the Arctic. More significant circulation occurs on the Atlantic side, with inflow north of Norway and outflow near Greenland. As a result of these currents, the sea ice drifts, generally cyclonically around the Pole. Because of the southward transport off East Greenland, ice is found there year-round, as far south as Greenland's southern tip (60�N). 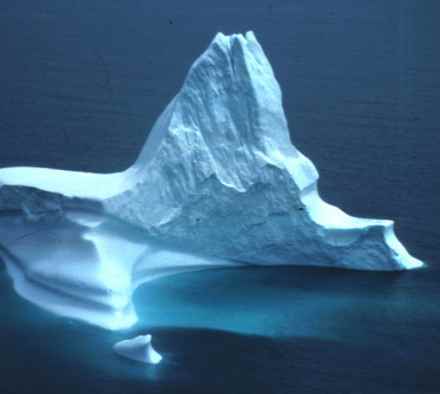 In the winter and early spring icebergs are found as far south as 45�N near Newfoundland, due to the Labrador current. This puts some icebergs in the main transatlantic shipping lane, a fact which proved fatal to the Titanic. The Labrador Current is anomalously fresh, especially in summer, because of the melting of ice. It proceeds from the southern tip of Greenland southwards along the coast of Newfoundland, where it deflects east the poleward warm and salty North Atlantic current, at about 52�N. The mixture of cold water from the Labrador current with saltier water may make the top layer unstable. Therefore deep-water formation often occurs near the edge of the Labrador current (5). Because of the high latitude, there is a strong seasonal cycle and a weak diurnal cycle. Annual mean incoming solar radiation north of the Arctic circle is 100 W/m2, most of it between the spring and autumn equinoxes. Midlatitude places receive about 150-200 W/m2 on average. As a result, daily mean temperatures are below freezing for several months: 3 months in Toronto (44� N), 8 months at Iqaluit (64� N), and 10 months at Alert (83� N) at the north end of Ellesmere Island. The lowest January mean near-sea-level temperature measured in the northern hemisphere (ie - 35� C) was measured at Alert. Record low temperatures have occurred in inland valleys, e.g. - 55.8� C at Lake Hazen. The daily temprature range is small because of the level Sun, i.e. less than 3 K, except in April and May when they may approach 6 K.
Precipitation from the cold air is modest, mostly under 250 mm/a. For instance Resolute (75� N) receives about 137 mm/a on average, mostly snow. All precipitation data in cold climates are only approximate, because snow is driven by wind and it is hard to discriminate between falling and blowing snow. The more mountainous regions, such as Baffin Island, Greenland (esp the southern coast) and northern Scandinavia receive more precipitation, for instance 663 mm/a falls at 390 m at Cape Dyer (Baffin Island, 64� N). Precipitation amounts increase with elevation. For instance, on Resolution Island just south of Baffin Island, 313 mm/a falls at 40 m elevation and 404 mm/a at 370 m. This is a 9 % increase per 100 m. Four stations on the White Glacier on Axel Heiberg Island at 79�N yield an increase of about 7%/100 m. These figures are comparable to the about 11 %/100 m for other latitudes (6). Cloudiness is rather high over the Arctic, and shallow stratus clouds prevail. There is a small but significant contribution to the cloudiness in Arctic regions due to an organic dimethyl sulphide compound called DMSP, formed in the ocean. The cells of phytoplankton (i.e. microscopic algae) burst when they die, releasing DMSP into the water. This degrades into molecules of insoluble sulphide, which are released into the air on the evaporation of spray, for instance. These aerosol molecules help nucleate cloud droplets (4). It is not as windy in the Arctic as near the Antarctic coast, in part because the pressure gradients are weaker, and because katabatic winds do not exist over most of the Arctic. Yet the katabatic winds which blow off West Greenland are sufficient to drive ice floes away from the shore, and to induce a northwards ocean current along the coast. (1) Woo, M.K. & A. Ohmura 1997. The Arctic Islands. In Bailey et al. 1997, p. 172 - 97 (2). (2) Bailey, W.G. , T. Oke & W.R. Rouse (eds) 1997. The Surface Climate of Canada (McGill-Queen's University Press, Montreal). (3) Hare, F.K. & M.K. Thomas 1979. Climate Canada (John Wiley & Son, Toronto). (4) Travis, J. 1994. Taking a bottom-to-sky slice of the Arctic Ocean. Science, 266, 1947-8. (5) Lab Sea Group 1998. The Labrador Sea deep-convection experiment. Bull. Amer. Meteor. Soc., 79, 2033-58. (6) Linacre, E.T. 1992. Climate data and Resources (Routledge) p. 266.